Students seeking careers in law enforcement may have images of “Blue Bloods” or “Hawaii Five-O” in mind when they begin their criminal justice training at Tidewater Community College. That’s why the college’s internship program with the Virginia Beach Police Department is so valuable. Regular ride-along shifts with the Virginia Beach police at one of the four precincts in the city. Tacked onto the 65-hour internship are 15 hours of service with Mothers Against Drunk Driving (MADD). Participation in an 80-hour internship with MADD, which allows students to observe court proceedings and attend a victim impact panel and an alcohol safety program. Writing a 22-page paper on a narrow topic in the field of criminal justice. 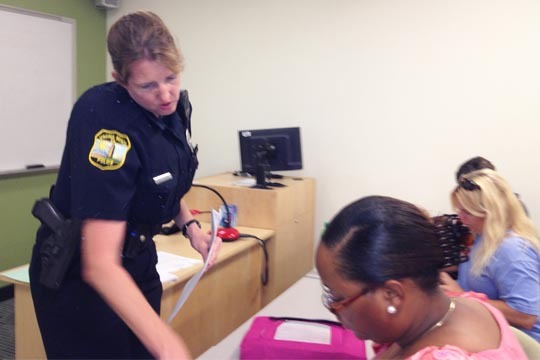 While other colleges in Hampton Roads participate in the Beach’s ride-along program, half the spots are given to TCC given the college’s successful working relationship with the department. The internship with MADD is under the guidance of Kaye and Bob Walsh, who lost their daughter, Robin, to drunken driving. The internship provides an eye-opening opportunity that leaves a lasting impact, Haley said.